Australian Medical Robotics Academy will train surgeons to conduct certain cancer procedures Victorian Government says. In what will be an Australian-first, the Victorian Government has announced plans to create a robot academy that will train surgeons in how to use the advanced tech to perform leading edge procedures on hard-to-reach and small spaces in the body. Robotics surgery is primarily used in the treatment of prostate cancer but has also been harnessed for gynecological procedures, as well as ear, nose and throat surgeries. Its precision leads to improved patient survival rates, lower infection rates, shorter hospital stays and faster recoveries. 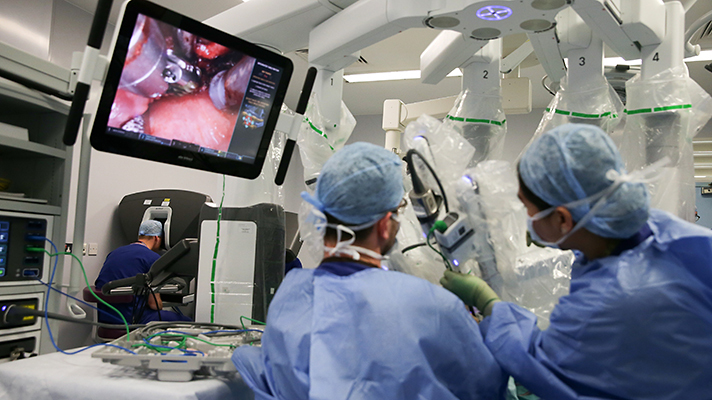 The Australian Medical Robotics Academy, which be located in the heart of Victoria’s biomedical precinct in Melbourne’s Parkville, will train surgeons to conduct minimally invasive surgery for prostate cancer and other conditions. Victorian Minister for Health Jill Hennessy earlier this month announced a $2 million funding injection into the Australian Prostate Centre’s plans to build the new international center for excellence in medical robotics. Robotics surgery currently is being conducted at a relatively small number of private hospitals in Victoria and the training will allow it to become more commonplace throughout the state and beyond, in what has been described as a major advance in everyday surgery. “This facility will usher in a new age of surgery that will change the lives of patients from right around the world,” Hennessy said. The robot academy will contain virtual reality simulators for surgeons to use to build their skills. The state-of-the-art technology provides feedback on the efficiency of their movements and errors during simulated surgeries, allowing clinical specialists to grow in proficiency before conducting procedures on live patients. According to the government, the Australian Medical Robotics Academy will be completed by the end of 2019.